When it comes to the 4th of July, there’s no such thing as “too much.” American flag shorts, patriotic bandanas, festive bathing suits, sparklers, cooking out, American beer, USA chanting… lay it on us! It’s a great day because everyone appreciates going over-the-top. Because God bless America! If you’re like us, you already have your outfit planned- red, white and blue will be on our shirts, shoes, and shorts, in our hair, and on our very skin (thanks to temporary tattoos!). But one place you might be neglecting is your nails! 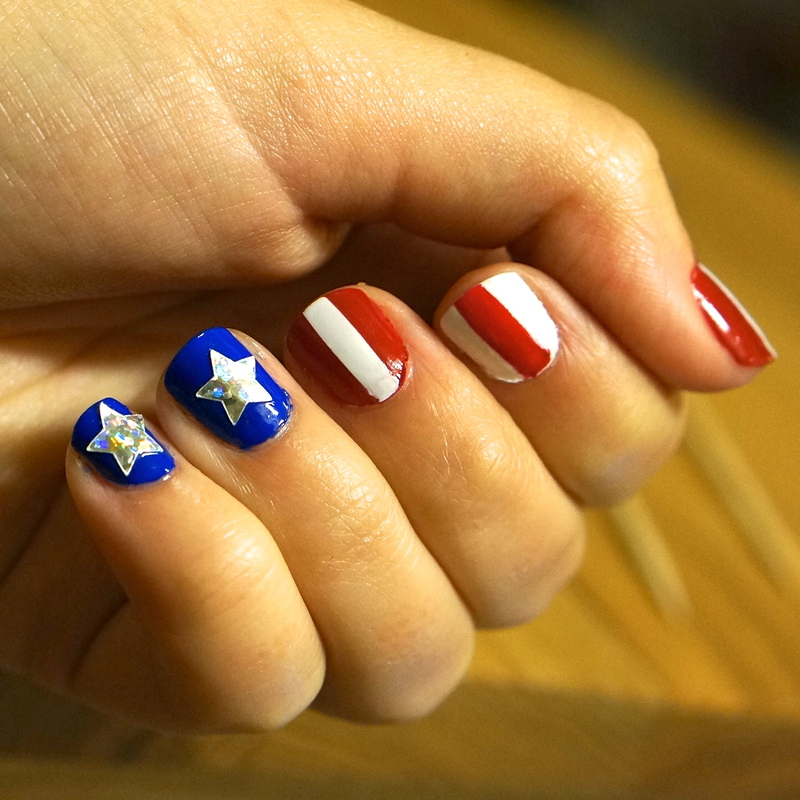 Don’t worry- we’re here for you with this adorable 4th of July nail design! 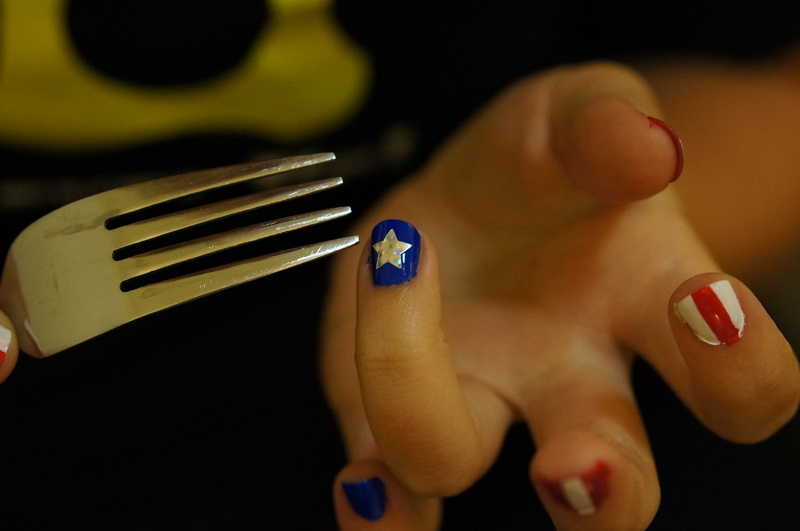 You’ll need a red nail polish, a white nail polish, a blue nail polish, small silver star stickers, a fork and a top coat. Paint each pinkie and ring finger with the blue polish, each middle finger and thumb with red polish, and each pointer finger with the white polish. Once this first layer dries, paint each finger with a second layer of polish. Once your nails dry, you will paint the stripes. 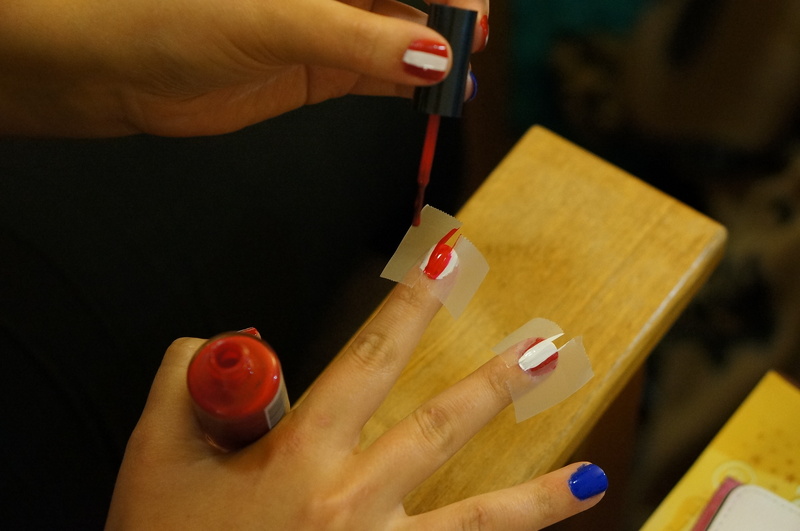 Use two peices of tape on each red or white nail to section off a stripe down the middle of your nail, as shown below. Paint a white stripe down the middle of your red nails and a red stripe down the middle of your white nails. 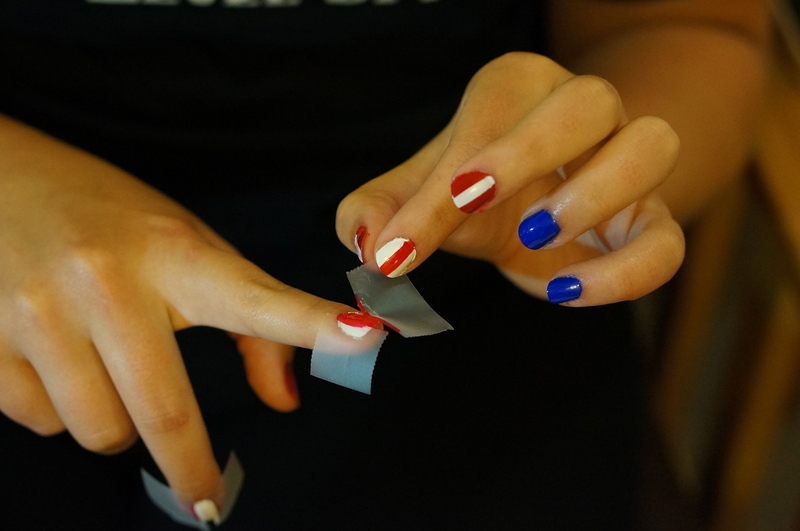 Once the stripes are dry, carefully peel the tape away from the nails. Paint a layer of top coat over your striped nails. Now comes the tricky part- placing the stars. It is best if you do this one nail at a time. Paint one of your blue nails with a layer of top coat. Quickly peel a sticker from its backing with your other hand and carefully and gently place the star on the wet topcoat. Use the fork prongs to carefully and firmly push down every part of the sticker into the top coat (which at this point should be tacky). Take special care with the points of the star. Repeat this with the other blue nail on that same hand. Once they are both dry, paint a top coat over the stars. Once the top coat is dry, repeat this with the blue nails on your other hand. Now paint five or six layers of topcoat over the blue and star nails. Seriously, paint as many layers as you think you need then paint three more. This will help the stickers from peeling up away from the nail. You’re all done! Now your hands are fit for the Fourth! Or a Captain America movie! We love how this shenanigan worked out. We’ll definitely be sporting this look on Thursday, will you? 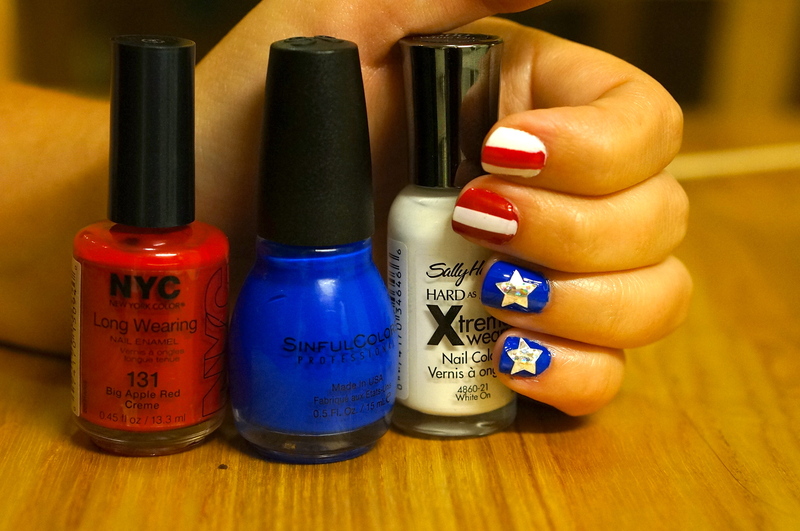 These are some of th best fourth or July inspired nails I’ve seen so far! They look amazing! I agree, they are really good! These are awesome!! Going to paint mine for tonight!!! HAPPY 4th to all.